HYANNIS – Tina Balog lives in what appears to be an ordinary ranch house in East Falmouth. But walk down the narrow stairs into the basement, down to a place her husband calls, “the bat cave.” There, filling almost every inch of space is a dense green jungle with vivid flowers of pinks, reds, yellows. There are some other plants, but mostly, this is a land of orchids, 700 to 1,000 of them. Tina Balog of East Falmouth is the longtime president of the Cape & Islands Orchid Society. The Cape & Islands Orchid Society’s 27th Annual Orchid Show is scheduled for January 23 and 24 at The Resort & Conference Center at Hyannis. The public is invited to take a break from winter and glory in the tropical splendor of these exotic flowers. A tour through Balog’s collection offers a glimpse into the multi-dimensional world of orchids. Among the hundreds of orchids in Balog’s basement are 10 different genera, Bolog said. There are too many species to count, so, in terms of “type,” she sticks to genera. “Talking in terms of anything else would be ridiculous,” she said, because the number of species—and hybrids—are dizzying. Looking around the basement, the variety of the plants is astounding. Balog’s basement contains 700 to 1,000 orchid plants. Balog pointed out Oceans of Spots, a showy mix of maroon against a pale yellow background. The flower is so exceptional, so perfectly balanced and intricately colored, it seems almost beyond nature. It is otherworldly. Nearby, there is the inky burgundy of the paphiopedilum Petula’s Pulsar. “In the orchid world, that’s red,” Bolog explained. She recalls driving in her car from a show with a large amount of orchids. “It’s an overwhelming pleasant odor, but it’s like being doused in perfume.” An intense smell, in other words. Balog, a geologist, is an environmental consultant. Her orchid hobby began 17 years ago and she has chaired the society’s annual show for 15 years. Her husband, Dave, a scientist at the Woods Hole Oceanographic Institution, does not participate in her orchid activities. But, as a scientist, he appreciates her intense interest in such a complex flower, she said. Orchids flowering for the upcoming Cape & Islands Orchid Society’s 27th Annual Show. Balog said her interest in orchids has evolved. “When I first started, I loved phalaenopsis. “They are fussy to bloom and easy to kill,” she said. A challenge, in other words. Her basement offered the space as well as the ability to control light conditions that is critical to successful orchid growth. The road to obsession when it comes to orchids is by necessity gradual. 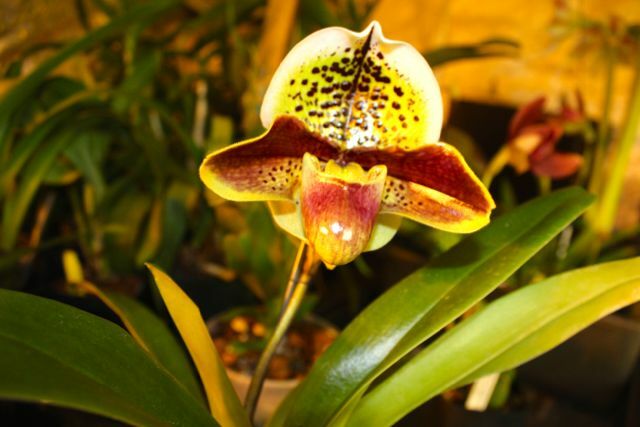 The sheer number of orchids in Balog’s basement and the many accoutrements that go with them, the grow lamps, fans, watering system, plus the number of hours that goes into the hobby, all spell a substantial investment in time and equipment. The answer to that question, for some, is clear: orchids. Balog was already an avid gardener when she got interested in orchids. She even has a small sideline called Tina’s Terrific Plants. “Orchids were the next challenge for me,” she said. “They seem to flower in the dark time of year.” For many orchid enthusiasts, that is one of the flower’s many attributes. The Cape & Islands Orchid Society has about 120 members, but Balog believes the number of orchid hobbyists in the region is far greater. Through her work as a geologist consultant who spends a good deal of time in people’s yards that are near wetlands on the Cape, Balog knows there are many more orchid fanciers on the Cape than the ones that are in the club. Orchids comes in a wide range of vibrant colors. “A lot of people have greenhouses full of orchids,” she said. She doesn’t know why they don’t join the club—perhaps they are just not joiners—but it is nice to know they are out there. Orchid hobbyists can be divided into two major categories, she said. There are the “windowsill growers,” the people who perhaps picked up a plant at Stop & Shop and have figured out how to keep it blooming. And there are the more serious collectors. The popularity of orchids being sold in supermarkets is a relatively recent phenomena, Balog said. Millions of orchids are shipped to the United States from Taiwan on container ships. They survive the long dark crossing on the ship because orchids don’t mind the dark, in fact they rather prefer it, Balog said. She focused in on one of her phalaenopsis, the kind that sell in supermarkets, and noted its appeal: the big fleshy leaves, the monopodial stem, the flower’s face, very round. “It presents nicely and lasts a long time,” she said. But perhaps the key to its popularity is its staying power. For those dedicated to the pursuit of the perfect orchid, there are a number of aspects to successful growing to consider. Orchids vary in how quickly they flower. The phalaenopsis, a popular plant, is fairly quick to flower, Balog said. But there are some orchids that take much longer., even months for the bud to develop. Most of Balog’s orchids are hybrids. The funny thing about orchids, Balog pointed out as she picked up a potted flower, is that in the wild, they grow sideways, clinging to the side of a tree. No wonder growing them in a pot is tricky. That’s why Bolog thinks certain methods of watering favored by florists, like the “ice cube orchid,” which involves putting an ice cube on the plant’s leaves, don’t make a lot of sense. Putting aside that orchids are a tropical plant, any water in the wild would hit the leaf and drip off, because of their sideways position. Having a part of the plant stay moist can rot it, she said. Balog said the most common mistake people make with orchids is putting the plant near a window exposed to bright sunlight. That’s why Balog uses grown lights—to ensure they get the type of light they like, under three kinds of grown lights, including a new type of florescent light. “They are more cool-growing than warm growing,” she said. In one section of her basement is a section of sprightly bright yellow flowers. “They’re flowering out for the show,” she said of the upcoming orchid show. Balog’s basement water source is a hose that she brings around to each plant and each gets individual treatment. When it comes to orchids, watering is a science; certain plants at certain times of year need a lot of water. The plants are in large trays on benches of different heights, depending on how close they need to be to the light. And each is potted a certain way, in moss or bark and that controls the amount of water to use. Between the watering and the light and the finicky nature of the plants, orchid-growing has long been a hobby for men who like to bring a certain finesse to the enterprise of orchid growing. “For generations, it’s been a male-dominated hobby, because of its technical requirements,” Balog said. Between the potting and the lighting, the orchid fancier needs some understanding of complex concepts, she said. There is much to learn and the orchid society brings in a variety of speakers to educate the members, particularly on how orchids grow in the wild. The appeal of being an orchid fancier includes the element of surprise. The variety is also attractive to hobbyists. “There are so many different textures and characteristics and habits,” she said. “They’re pretty outrageous.” Especially when compared to others in the plant world. “You won’t find someone with the same passion about geraniums as you will with orchids,” she said. There are different shapes and heights and colors. By example, she pointed to a masdevallia, a small, pointy flower in vibrant red. Tina Balog ties up an orchid flower. There is always intrigue surrounding orchids. When a new variety was taken out of Peru in recent years, and a botanical garden in this country described and named it. “People got fined and sentenced to jail. That’s just orchid politics, you know,” she said. Balog said the flower just draws that type of attention. “Orchids are really fascinating and they still drive people crazy, oddly enough,” she said. The orchid world is always evolving and these days China is getting into the game. “China is the brave, new world of orchids,” she said. Balog said that the Internet, while joining orchid enthusiasts, has taken some of the joy out of the hobby. “The Internet has made it ordinary, somewhat,” she said. It is no surprise that Balog advises that the best place to purchase an orchid plant is at an orchid show, as opposed to getting a “bargain” plant at the local supermarket. “You pay a little more for something that is a lot better quality,” she said. Tina uses her extensive growing experience to select plant and vegetable varieties designed to grow in our fickle Cape Cod environment. Starting from seed, Tina grows many tried & true heirloom varieties. Distinguished for their flavor, texture and color, many tomato varieties like the Early Producer, Mr. Stripey, and the Mid Season German Johnson, can be found no where else on Cape Cod, certainly not at the big box store. Herbs like Lemon Basil add a unique flavor to salads and cooked dishes while Orange Scented Thyme can be used for meats and stews; a perennial in most places.